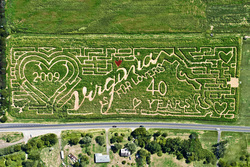 Patty Leonard of the family-owned Cows-N-Corn in Midland commissioned the giant maze as a tribute to Virginia's iconic tourism slogan, which will celebrate its 40th anniversary in 2009. The Virginia is for Lovers design takes the corn maze craze to the next level, weaving in and out of nine acres of golden corn stalks, navigating through the maze for an authentic fall travel experience found only in Virginia. The Leonard family began planting the seed, literally, for the corn maze in June. Add 50,000 seeds per acre, water from the heavens, Virginia sunshine and a good bit of artistry to achieve nine acres of pathways that lead to the "heart" of fall travel passions in Virginia. The maze at Cows-N-Corn is open to the public every Friday, Saturday and Sunday through November. Admission is $8 per person with children three and under free of charge. Families also love the farm's pumpkin picking, play area, hayrides tours, butter-making demonstrations and meeting one of the Leonard's beautiful bovines up close at "Cow Class", a kid favorite. More information is available at http://www.cows-n-corn.com or FallinVirginia.org. Fall is one of Virginia's finest travel seasons, as 15 million acres of foliage burst into color, timed with the harvest at more than 130 wineries across the state. Cows-N-Corn and other family-friendly destinations offer pumpkin patches, festivals, farm tours and adventures for the perfect fall experience. Visit http://www.FallinVirginia.org to see the world's only Virginia is for Lovers corn maze and to start planning a fall getaway in Virginia. Or call 1-800-VISITVA for additional travel planning resources.